Currently, players can choose from hundreds of different Video Poker games variations, each available with multiple different paytables. On top of that, you can play from 1 to 100 Video Poker hands at the same time. Exotic twists like Spin Poker (a combination of slot machines and Video Poker) and Multi Strike Poker (multiple hands with incremental payouts) add further to the variety. It took Video Poker decades to build such immense game variation, since the first Video Poker game, Poker-Matic, was introduced in 1970, and since Jacks or Better appeared at the beginning of 1980s. If you are interested in learning more about how it all started and evolved, read our article about Video Poker history. Below are some of the most popular and highest paying Video Poker games available online and in land based casinos. Click on the link to visit the dedicated page, complete with strategy as well as software providers and casinos where you can find the highest paying versions of each game. Jacks or Better - The most popular Video Poker game online or at land based casino, with 99.54% full pay version RTP and low variance. Pick'em Poker - rather new Video Poker game featuring highest RTP online at 99.95%, it also features the lowest variance and the easiest to learn strategy. Double Bonus Poker - The RTP of the full pay version is 100.17%, however, only lower paying versions are available online, with even higher variance than Deuces Wild. Double Double Bonus Poker - Just as with Double Bonus, it offers a higher payout for four Aces, and high (100.07%) RTP, as well as high variance. As I already mentioned, feel free to click any of the links above to read our articles about the specific games. You can find strategies for each of the games in their respective articles. Progressive Jackpot Video Poker games usually offer progressive jackpots for specific combinations, usually for a Royal Flush. Sometimes multiple Video Poker machines are linked together to be able to provide a higher jackpot. It is important to remember that the higher the progressive jackpot, the higher the theoretical payout of the game. 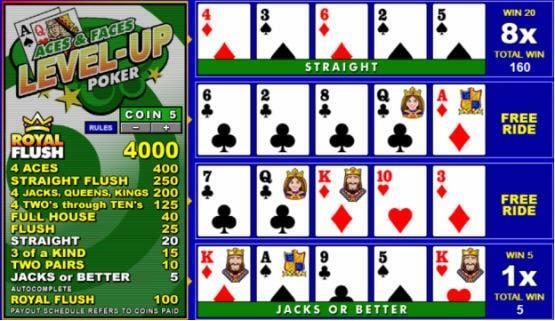 Multi Strike Poker or Level Up Poker is a unique Video Poker variation, with four levels of hands. The upper hand is worth twice as much as the one below. In order to move one level up, you have to hit a paying hand, usually Jacks or Better. However, you have to wager an amount for all four hands, regardless of whether you are able to climb to the top or not. This game features extremely high variance, and you have to adjust your strategy to increase your chances to climb higher. There is also a free ride feature – a wild card that will enable you to move to the higher level hand, even if you don’t have a paying hand. The theoretical payout compared to regular Video Poker with the same paytable is a bit higher (usually by around 0.20%-0.30%). 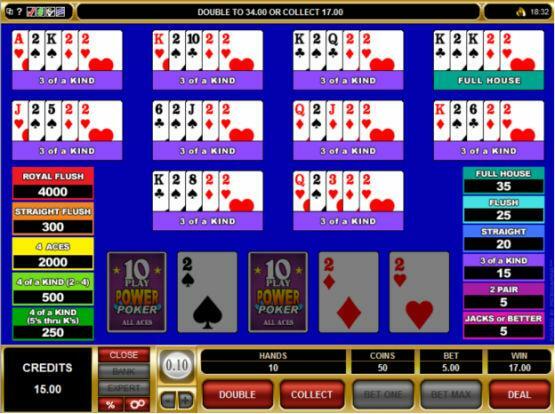 Multi-Hand Video Poker is a Video Poker game that lets you play multiple hands at the same time. Most commonly, multi-hand Video Poker machines will let you play 5,10,50 or 100 hands at once. Variance is also higher, as you have to place your bet for all the hands you are playing, but the outcome is decided for each of the hands separately. Basically, you receive your first 5 cards and select the cards you want to hold, as you would in a standard Video Poker game. The held cards remain the same for every hand you play, but the cards you exchanged will be generated for each of the hands separately. With an initial combination of three of a kind, the player is guaranteed to hit AT LEAST this combination for each of the hands (if the three 2’s are held in this example). If you play less than 5 credits per game, the theoretical payout usually decreases by more than 1%, even if you play perfect strategy. Be sure to read our Video Poker strategy article for even more tips on how to increase your chances of winning at Video Poker. Alternatively, read the articles about specific Video Poker games to get to know them better and discover the best way to play them. The best way to learn how to play each Video Poker variation is to play Video Poker for free with no need to download or register an account. Then, make sure you learn the proper Video Poker strategy, which can be found on this site, or you can use tools like VP Strategy Master to calculate the strategy for most types of Video Poker games available (but it’s a paid tool, costing $29.95). 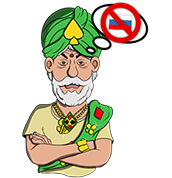 There is also a free tool which covers fewer games available from Wizard of Odds. As soon as you are able to master the Video Poker strategy, you can either make a deposit and take advantage of deposit bonuses for Video Poker, or take advantage of no deposit bonuses and try to win without risking your own money.